When Stella's only friend in the world, Cam, moves house, Stella runs away. She's determined to find out who her mum was and who she is too. She ends up in the Crystal Cove, a run-down aquarium with a mermaid show. There she meets Pearl who reveals disturbing secrets. It's only by facing her fear of the ocean that Stella will truly uncover the truth. Summer is here with a loud bang. Wimbledon and strawberries, blue sky and sun, sandy beaches and ice cream, as well as loads of great books to read. With so many books wanting and waiting to grab your attention, July is all about books that inspire the readers to escape and to enjoy the great outdoors. 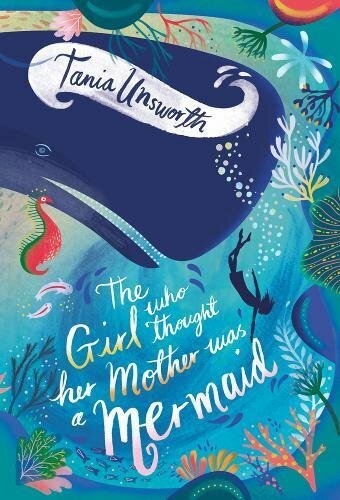 The first book for review is Tania Unsworth, The Girl Who Thought Her Mother Was a Mermaid, published by Zephyr on the 12th July 2018. The book cover artwork by Helen Crawford-White is absolutely brilliant and instantly makes you want to explore the story inside. All you have to do is turn the pages and dive straight into the crisp cool waters of the narrative. Once the pages are turned, you are introduced to the main character, Stella. Unfortunately, at eight years old she unexpectedly loses her mother to illness. The narrative is filled with sadness and loneliness exploring the character's grief. However, things begin to look brighter when a new neighbour, Cam, moves in next door. The story takes you on an uplifting adventure of self-discovery and friendship which washes over the reader like gigantic waves crashing against the shore. It's a story of self-discovery that will shine brighter than the sun regardless of age or gender. This is a brilliant story in which to escape to. As you dive below the sea, it gives you a whole new perspective on the world. It's a book full of wonder and mystery that leads the reader down a path full of dark magic and a heartfelt story. I loved the simplicity of the plot, which is delivered with great imagination, whilst the storyline challenges the beliefs of the reader and the characters of the book in so many ways. I loved the conversations between Stella and her grandmother. With her loss of memory, it was very well written and incredibly endearing. It really enhanced the storyline of the plot through the poignancy and compassion shown whilst still managing to explore the reality both characters face within the story. I also loved the balance between fantasy, reality, dialogue and action. It really makes this story an amazing lazy summer afternoon read. This is a great recommended read that whets the appetite. It's about facing your fears and looking for the truth.